Gardeners and farmers who live in colder climates are well aware of the limitations posed by a short growing season. But these challenges often yield outstanding innovative practices, such as those used by Growing Power in Milwaukee, Wisconsin. Growing Power harnesses natural cycles to power a farm that produces over one million pounds of food every year. Because of its ultra efficient greenhouse system, Growing Power is able to continue its harvest even through the frigid Great Lakes winters. Will Allen, the founder of Growing Power, created an aquaponics system that captures energy produced by natural systems. The greenhouses are heated by indoor compost piles, which generate heat as they break down organic matter. These compost pile heaters are also an excellent source of fertile soil for growing high-quality vegetables and fruits. In the greenhouse, vegetables are grown in an aquaponics system, which incorporates fish into the food production ecosystem. The fish are fed and then produce waste, which contains nitrogen that is absorbed by a plant’s roots. Before waste water is applied directly to plants, it must first go through a gravel bed where bacteria breaks down impurities in the water. Watercress is also planted in this space for additional filtration. Filtered water not absorbed by vegetables crops in the subsequent levels is returned to the 25,000 gallon tank below, where thousand of tilapia live. The tank is calibrated to mimic the murky, warm waters of the Nile River, where tilapia school in the wild. Growing Power founder Will Allen grew up on a small farm in Maryland, where his father worked as a sharecropper. Following early careers in professional basketball and corporate sales, Allen found his calling in farming and community organizing. In 1993, Allen founded a three acre farm in Milwaukee and was quickly approached by neighborhood youth who wanted to learn about growing. Allen obliged. Today, Growing Power’s Youth Corps continues to provide young people the opportunity to build skills and community through growing food. 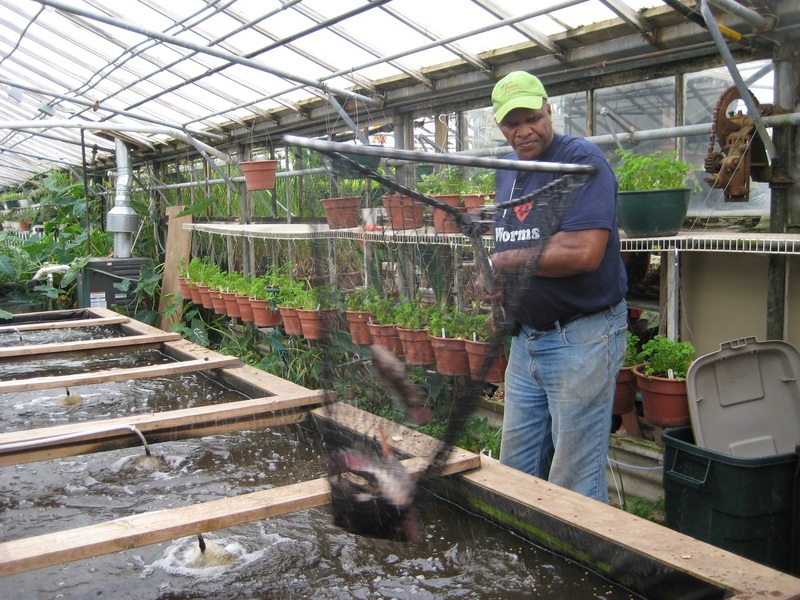 Will Allen of Growing Power lifts the catch of the day from an aquaponics system. 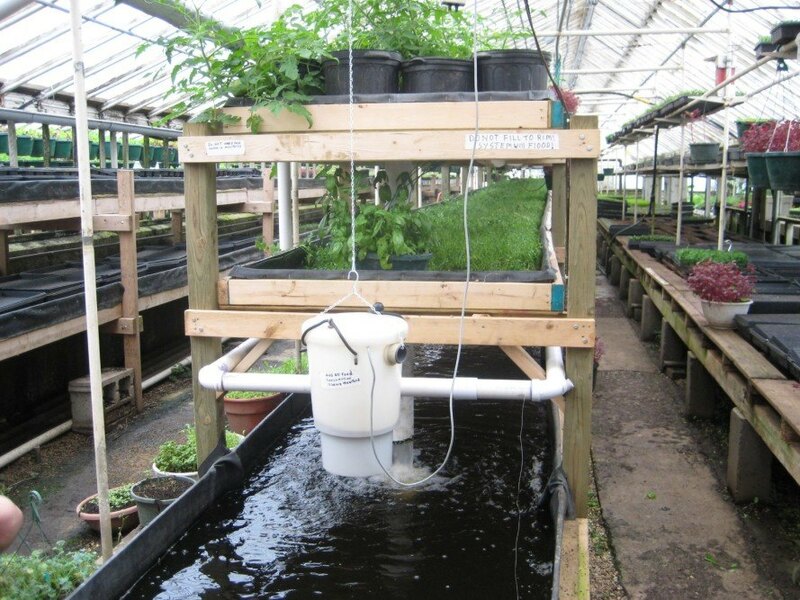 The aquaponics system used at Growing Power in Milwaukee, Wisconsin. 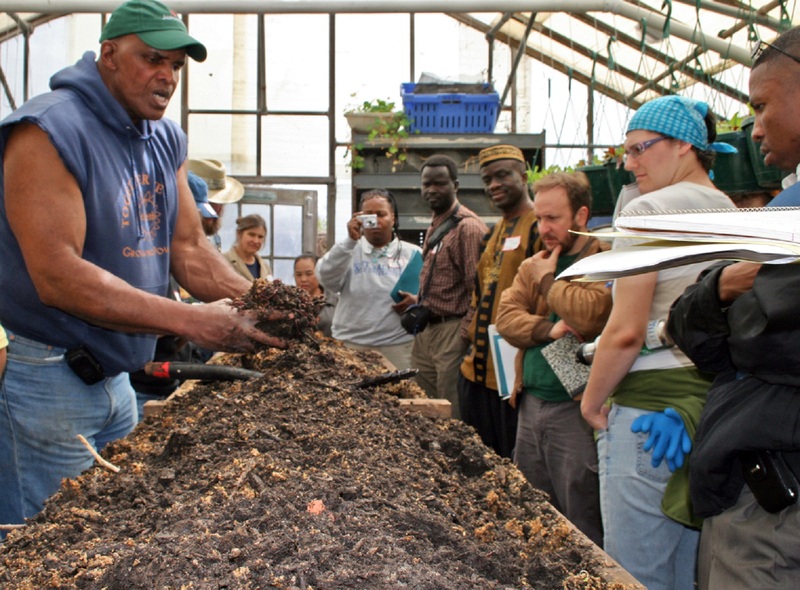 Will Allen demonstrated compost produced by Growing Power's system.